Back in November, 1,049 Japanese people were asked by survey company goo Ranking to choose which animated or Tokusatsu (think Godzilla or Power Rangers-style) movies of 2012 they would recommend to other people. Here are the top five recommended films of 2012—all of which are anime. The most recommended movie by a wide margin was The Wolf Children Ame and Yuki. This is a slice-of-life tale about a human single mother raising her half-wolf children in modern Japan. It's a heart-warming tale focusing on the themes of parenthood, community, and the return to nature. If you're jonesing for a family adventure, The Wolf Children Ame and Yuki will no doubt tide you over for a long while. The next most recommended film was Evangelion 3.0: You Can (Not) Redo. Like it or hate it, no one will dispute that it completely destroyed any and all expectations that fans had going in. The Evangelion presented in this film is unlike any other and is so far removed from the events seen in the original series, it's difficult to even compare the two. So if you were thinking this film would be similar in tone to the other Rebuild of Evangelion movies, cast those illusions aside. You're in for a wild ride with this one, if nothing else. Click here for our full (and spoiler-filled) review. Detective Conan: The Eleventh Striker is the sixteenth film in the long-running Detective Conan (aka Case Closed) series. This time out our teenage genius detective (who is, as always, trapped in the body of a young child) is dealing with a serial bomber who has been planting bombs at high profile soccer games. Conan and the rest of the main cast try to decipher the criminal's cryptic clues to find where the bombs are and how to stop them. It is a fun little mystery adventure that will keep both children and adults entertained till the very end. The fourth most recommended film was the twelfth and latest film in the One Piece franchise: One Piece Film: Z. This film is largely focused around the titular villain "Z" and his plan to rid the world of pirates. What comes out of this story is an incredibly well-developed and sympathetic villain who outshines even the franchise's main cast in this outing. Doraemon, the earless robotic cat from the future, is back once again in his 32nd movie. This time he, along with the usual gang, travel to an island where extinct animals still roam the land and battle against forces from the future to protect it. Outside of the top five, other notable titles include the only non-Japanese movie in the top ten, Dreamwork's Puss in Boots, which came in at number six. The two Madoka Magica movies were the eighth most recommended, while the CG video game tie-in Resident Evil: Damnation took the number ten spot. 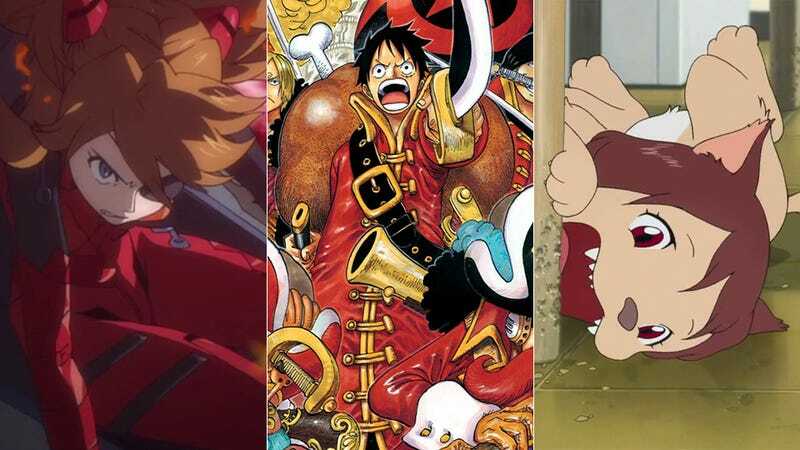 Among the other anime movies we have looked at here at Kotaku East in 2012, 009 Re:Cyborg came in at 16, Berserk Golden Age Arc II: The Battle for Doldrey at 19, Tiger & Bunny: the Beginning at 24, and Macross FB7 at 27. To check out the full list, head over to What Japan Thinks to see the entire survey translated into English.